This one was over by the end of the first quarter, which is kind of silly if you think about it. The Lakers worked over the defenseless Warriors en route to their third consecutive victory to start the season. Pau Gasol scored 26 points, grabbed 12 rebounds and added four assists. Kobe Bryant had 20 points and seven rebounds and Lamar Odom had 16 points, 14 rebounds and four assists. Monta Ellis had 20 points for Golden State. The question now is, when will the Lakers lose a game? It might not happen this week, what with games against Memphis on Tuesday, Sacramento on Wednesday and Toronto on Friday. The Lakers could be 8-0 by the time they play the Nuggets in Denver on Nov. 11. The Lakers are halfway to their third straight victory to start the season, toying with the Golden State Warriors in the first half tonight at Staples Center. Four of their five starters have scored in double figures already, led by Pau Gasol with 16 points. Lamar Odom had 13 points, 10 rebounds and four assists. He might get a triple-double if he plays enough in the second half. The way things are going, it might be a stretch. Monta Ellis has 17 for Golden State, which has resorted to chucking 3-pointers in an attempt to play catch-up. Coach Phil Jackson gave the Lakers’ starters a break from practice today, after all five of them scored in double figures in the team’s 114-106 victory Friday over the Suns. Only the backups practiced, and that included Luke Walton, who has a nagging strained right hamstring. Walton has been inactive for the Lakers’ first two games. He could be sound enough to make his season debut tonight against the Golden State Warriors. If it doesn’t happen tonight, then Tuesday against the Memphis Grizzlies might be a better bet. PHOENIX — All five starters scored in double figures, led by Kobe Bryant with 25 points, and the Lakers gave Phil Jackson his 1,100th coaching victory tonight with a win over the Phoenix Suns. It was a rematch of the Western Conference finals last spring, and the Lakers won that one, too. Pau Gasol added 21 points and Lamar Odom had 18 points and a team-leading 17 rebounds for the Lakers (2-0). Grant Hill had 21 for Phoenix (1-2). PHOENIX — It was fast, but not as fast as the Phoenix Suns might have liked in the first half tonight. The Lakers didn’t allow the Suns to run amok in the first half, holding modest leads for most of the early minutes. The Lakers might have taken too many shots too quickly, but for the most part their pacing was just fine against the hyperactive Suns. Pau Gasol led the Lakers with 14 points on 7-for-9 shooting, and Kobe Bryant scored 12 on 5-for-12 shooting. Grant Hill scored 14 points on 7-for-12 shooting a little more than 16 minutes. PHOENIX — Luke Walton was listed as “out” for tonight’s game against the Suns. After sitting out Tuesday’s regular-season opener against the Rockets because of a strained right hamstring, he said he hoped to practice Wednesday or Thursday. It didn’t happen, and he was left off the active roster tonight, joining Andrew Bynum (right knee surgery). Theo Ratliff, who has tendinitis in his left knee, was listed as questionable to play. Neither Walton nor Bynum traveled with the team. It’s true. 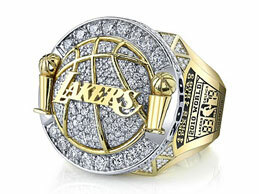 Ron Artest will raffle off his championship ring and donate the proceeds to charity. Check out the details at his website ronartest.com. On the day after they opened the season with a 112-110 victory over the Houston Rockets, the Lakers returned to the practice court today in El Segundo. Well, some of them returned to the practice court anyway. Kobe Bryant did not participate in the workout. He was joined on the sidelines by Andrew Bynum (right knee surgery), Theo Ratliff (tendinitis left knee) and Luke Walton (strained right hamstring). Walton might give it a try today. As a rule, Bryant practices infrequently, but the Lakers also are determined to limit his activity after he underwent offseason right knee surgery. Bryant scored 27 points on 8-for-20 shooting and played 37 minutes, 4 seconds Tuesday against the Rockets.